John Szarkowski died just over three years ago. I noted his passing here. Today The Guardian has run this appropriately appreciative essay by Sean O'Hagan on the late photographer/curator/advocate. As often as not, I find O'Hagan's offerings at The Guardian to be wildly off the mark, verging sometimes on being literally incomprehensible. Not this time. I think his basic point - that Szarkowski may well have been the most influential figure in 20th century photography - is plausible. Even if that claim is not entirely persuasive, it nonetheless points us in useful directions - away from photographs and toward photography and how different people use it for different purposes. (One obvious, ironic implication is that we need to be less pre-occupied with photographers.) 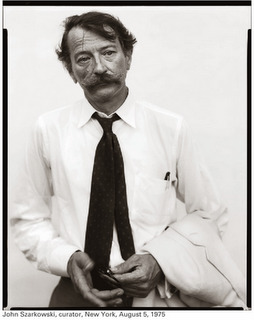 In the 1960s Szarkowski integrated the art world, making photography a respectable medium in that domain. Now, I wish he had been less successful, because photography is too important to be placed in the hands of museums and galleries and curators and art historians. But the tale of how photography became an art form is worth recalling just insofar as it was an 'achievement', an artifact of a concerted campaign.